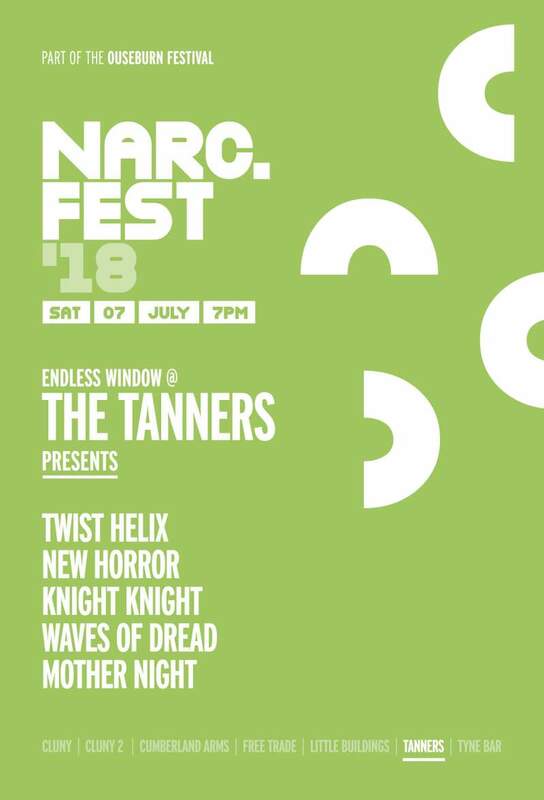 We’ve been honoured to host a stage at The Tanners Arms for NARC. Fest for the last three years, bringing you acts like Basic House, Ceiling Demons, Transfigure, Parastatic, Elisabeth Elektra, Grey Tapes and more. For our fourth year, we’ve decided to bring you the ultimate summer evening soundtrack – a mixture of synth-pop, psychedelia, shoegaze and dance from five of our favourite acts on the scene. Headliners Twist Helix have gained national and international attention for their sparkling, ideas-packed electronic pop, with a plethora of sold-out shows and European tours under their belt. Having released their brilliant new single Ouseburn earlier this year – an ode to, well, the Ouseburn – we’re incredibly excited to see what they bring to this closing slot as part of the Ouseburn Festival. Given how euphoric their live show is usually, the chance to see them in an intimate and friendly venue like The Tanners is not to be missed! Joining them on the bill are the stylish New Horror, whose drum machine driven sound takes influence from expected sources like The Jesus & Mary Chain and The Smiths, but has increasingly expanded to take cues from nineties rave and lo-fi house. Dramatic and grandiose, their night-time slot is sure to be a dark delight. A new project from acclaimed folk artist Ditte Elly, Knight Knight finds her taking a detour into futuristic R&B and intense electronica. Having already received significant acclaim for her debut single Boy and live shows (including a slot at Cobalt’s Violets series), this is a rare opportunity to see this exciting new work in person. Another new artist we’re delighted to have on the bill is Waves of Dread (who include members of Headclouds amongst their number), whose beautiful and experimental dream-pop has already seen them share the stage with A Festival, A Parade, be selected for this year’s Evolution Festival and receive significant blog hype for their early demos. Startlingly fully formed for such a new band, their hypnotic and melodic sound is perfect music for a summer’s evening. Opening the stage is another newcomer to the Newcastle circuit who’s found themselves rapidly in demand, the eclectic pagan pop of Mother Night. Having recently moved to the North East from northern Scotland, Mother Night’s music nods at acts like Tame Impala and Caribou with songs full of driving bass lines, electronic trickery and engaging vocal melodies, merging dance hooks with psychedelic pop. Having already become a local favourite on the back of shows with Blown Out, Cool Ghouls and Sugar Candy Mountain, his opening set at The Tanners is a must see. With five brilliant live acts in one of the Ouseburn’s finest pubs – and all for free entry! – we’re looking forward to welcoming you back for another diverse and delightful Endless Window night.